The biggest shared resource you're going to find on the Internet. 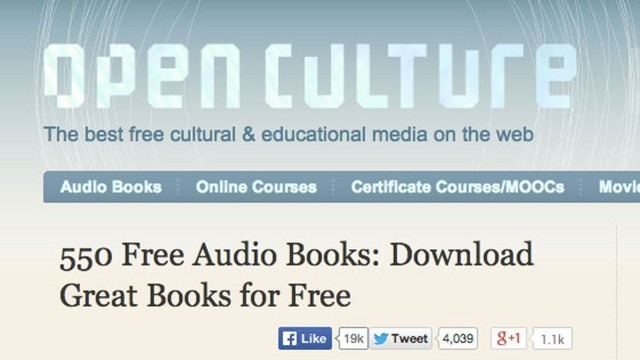 Open Culture offers hundreds of free audiobooks, mainly on classic novels such as Jane Austen's Pride and the Prejudice and many more. "THIS WEBSITE IS SO EDUCATIONAL. I ACTUALLY FIRST CAME ACROSS THIS BECAUSE IT WAS RECOMMENDED BY MY PROFESSOR. IT'S A CULTURAL WEBSITE AND I LEARNED A LOT FROM IT. THE MOVIES ARE JUST A BONUS. " "I like this site because it has a vast repository of resources for learning and enjoying culture. There are lectures, audio books, e-books, and a large repository of lessons to learn various topics from astronomy to physics. If you want to learn you can also access a large repository of over 200 textbooks which you can use as part of the lessons on the site." "This website provides free courses on a variety of topics, from astronomy to math. It includes a mass number of language learn lessons as well, from Arabic to Spanish. The website also has over 1000 movies and over 700 e-books free to read." "It looks like very good website but it is very limited. It has only 700 free audio books. The reason of this limit is that, they are legal and providing these materials free." 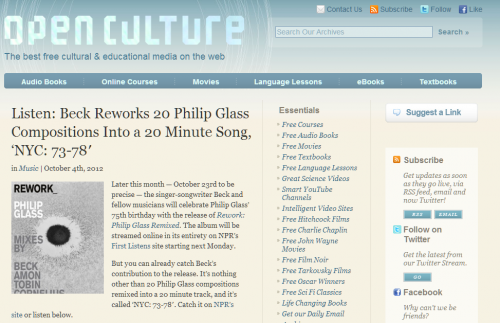 "Open culture doesn't only offer audio books, they offer a lot more than I expected. I also downloaded a bunch of e-books I've been wanting to read for so long. " "They didnt have much book. Just a few and most aren't that famous. But they do offer audiobooks in high quality which is great. " "Classic audiobooks can be found here. Works of Tolstoy, Twain, and other renowned authors are in their catalouge. However, the interfae of the website is a bit not user friendly for me as direct download button is not displayed." "This site has a lot of videos and other learning opportunities, even though most of them are based on cultural learning, such as artistic work. It boasts having over a thousand online courses available." "i think this is a great option"